As the name suggests, PVCu tilt & turn windows can be tilted inwards or swung (turned) inwards on the hinges, by operating the handle in a different position. They were originally designed in Germany for high rise flats so that the windows could be cleaned from inside. PVCu tilt & turn windows offer lots of ventilation and ideal for conservatories, particularly if they are south or west facing and would otherwise get too hot inside. PVCu tilt & turn windows do however have some disadvantages as they tend to have wider frames to accommodate the complex operating systems and locking mechanisms. You also need to be aware that obstructions such as furniture and taps in a bathroom or kitchen can restrict their usage and the large openings can be dangerous in a child’s bedroom for example, although they do offer excellent fire escapes. 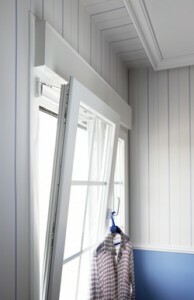 How much are PVCu Tilt & Turn Windows? PVCu tilt & turn windows are more expensive than PVCu casement windows because of they take longer to manufacture, have more expensive operating systems & locking mechanisms and not least because the PVCu profile, being wider, is more expensive to produce. 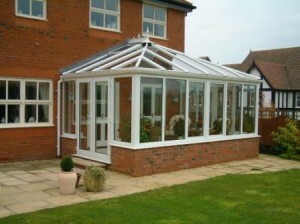 Nevertheless, in conservatories they have some advantages over PVCu casement windows. Firstly, they are stronger than PVCu casement windows due to their wider frames, PVCu tilt & turn windows can be manufactured in larger sizes than PVCu casement windows and consequently, for a given size of conservatory you may need fewer (but larger) windows if you choose PVCu tilt & turn windows. Also, since the expensive part of PVCu windows are the opening sections and they have much larger opening sections than PVCu casement windows, again, you will probably need fewer opening vents if you choose PVCu tilt & turn windows. Another, major advantage they have, particularly when used in conservatories, is the lack of a transom bar (the one that is normally at eye level when you choose PVCu casement windows) which provides a better view out of the conservatory into your garden.